Dedicate the 6th (Wed) to wine at some of the top wineries in the area. The adventure continues: take in the views from Golden Gate Bridge, take in the waterfront at Fisherman's Wharf, take a memorable ride with Cable Cars, and wander the streets of SoMa. 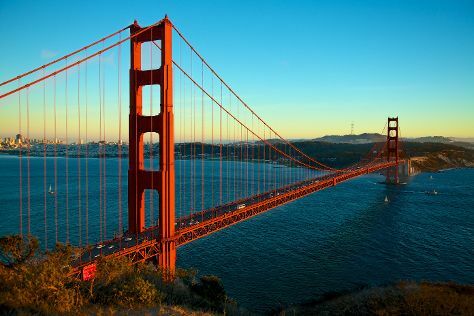 To see traveler tips, more things to do, maps, and tourist information, read our San Francisco journey site . If you are flying in from United States, the closest major airports are San Francisco International Airport, Metropolitan Oakland International Airport and Norman Y. Mineta San Jose International Airport. In June, daily temperatures in San Francisco can reach 71°F, while at night they dip to 55°F. Cap off your sightseeing on the 9th (Sat) early enough to travel to Berlin. Berlin is known for museums, historic sites, nightlife, parks, and shopping. Your plan includes some of its best attractions: ponder the world of politics at Reichstag Building, see the interesting displays at Pergamon Museum, admire nature's wide array of creatures at Zoo Berlin, and pause for some photo ops at Brandenburg Gate. To find more things to do, other places to visit, ratings, and tourist information, read our Berlin trip maker . Traveling by combination of subway and flight from San Francisco to Berlin takes 16 hours. Alternatively, you can do a combination of flight and train. You'll lose 9 hours traveling from San Francisco to Berlin due to the time zone difference. Finish up your sightseeing early on the 14th (Thu) so you can travel to New Delhi. New Delhi is known for historic sites, parks, shopping, museums, and fun & games. Your plan includes some of its best attractions: don't miss a visit to Humayun's Tomb, contemplate the long history of Gurudwara Bangla Sahib, take in panoramic vistas at Qutub Minar, and explore the historical opulence of Red Fort (Lal Quila). Make your New Delhi itinerary with Inspirock to find out what to see and where to go. You can fly from Berlin to New Delhi in 12.5 hours. You'll lose 4 hours traveling from Berlin to New Delhi due to the time zone difference. In June in New Delhi, expect temperatures between 102°F during the day and 81°F at night. Wrap up your sightseeing on the 17th (Sun) to allow time to travel back home.